3K high density carbon outer layer that improves strength and efficiency of energy dissipation over the shell. UD carbon composite layer that gives significantly greater radial strength around the shell, preventing compression but allowing controlled deflection for reducing transmitted impact energy. Aramid fiber layer which provides critical penetration protection. The Supertech shell construction is optimized to offer the best fit across the range of four size options. Shell sizes are manufactured in small, medium, large and extra-large to ensure that riders have the correct fit which not only improves comfort but, most importantly, the effectiveness of the helmet in an impact. The Supertech M10 liner construction combines with the shell to offer highly efficient impact energy management. 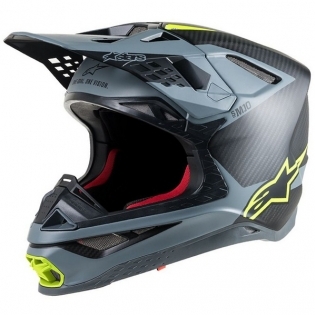 Weight is both a factor in riding performance and safety in a helmet and to ensure the M-10 offers the ultimate in weight saving performance enhancement, preparation and construction of the helmet has been rigorously analyzed for weight to strength and energy absorption properties and a strict analysis of all the components used in the Supertech finishing. The Supertech M-10 incorporates a patented system to allow the helmet to be tuned exactly to the riders preference for the height and angle at which the helmet sits on the head. This unique technology allows for an ultra-specific set-up that can be adapted for the type of riding and the rider’s preference. The base of the M-10 has been sculpted to give a relief section, where the bottom profile is raised to clear the collarbone. Also, incorporated into the area of the base pad, where it sits over the rider’s collarbone, is an energy absorption pad; a more flexible compound rubber section which allows deflection when it contacts the collarbone. A low friction ‘slip’ layer is incorporated into the Supertech helmet, between the comfort padding layer and the multidensity polymer energy absorption shell. When energy is impacted upon the helmet, causing a rotation force, the MIPS layer allows for movement of the inner absorption layer to damp and re-direct the energy before causing significant acceleration stress to the brain. This mitigates the causes of brain injuries, such as concussion. 3K, high density carbon outer layer that improves strength and efficiency of energy dissipation over the shell. UD carbon composite layer that gives significantly greater radial strength around the shell, preventing compression but allowing controlled deflection for reducing transmitted impact energy. This three-layer composite combination is given even greater performance with an epoxy resin bonding that offers the best possible strength and energy management. The combination of material layers gives improved energy management: limited outer shell deflection making the energy spread wider and better absorbed by the EPS liner. 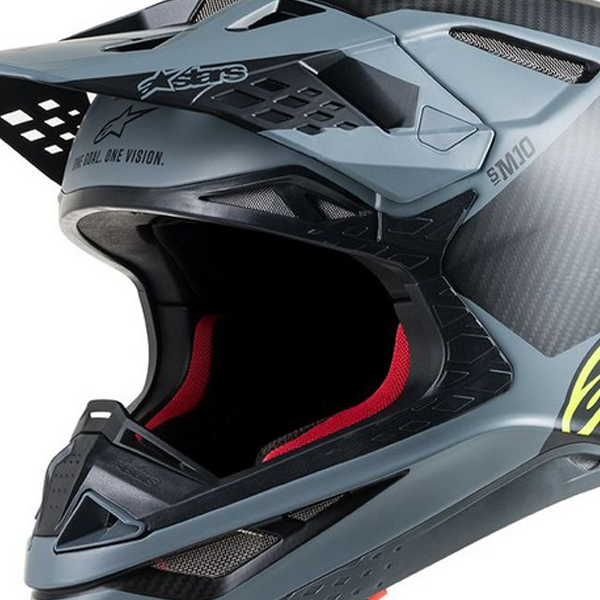 The Supertech helmet lining design includes channels which allow a tube to be incorporated on either side of the shell. 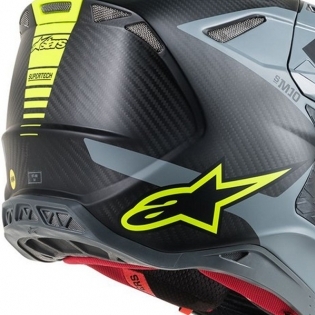 This is a feature extensively tested by Alpinestars rally raid and enduro riders enabling convenient fitting and connection to a hydration system. The result of the unique shell lay-up process employed in the M10 construction results in extremely effective impact protection. 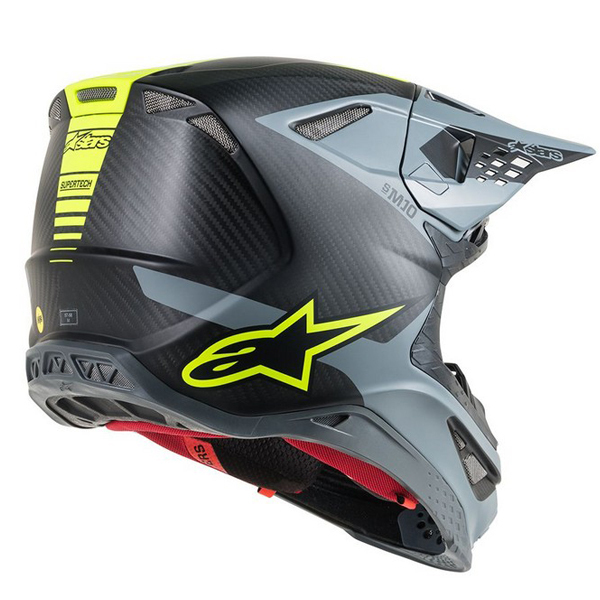 With a fully equipped helmet testing facility, within Alpinestars Racing Development Center, an exhaustive impact research program has resulted in the Supertech returning linear and oblique impact performance which far improves upon current helmet regulation standard limits. M10 in four anatomical shell sizes or direct, linear, impact by an average magnitude of 41% and for rotational acceleration, oblique, impact performance by an average of 48%. M10 in four anatomical shell sizes. The Supertech shell construction is optimized to offer best fit across the range of four size options. Shell sizes are manufactured in small, medium, large and extra-large to ensure that riders have the correct fit which not only improves comfort but, most importantly, the effectiveness of the helmet in an impact. The energy absorption performance of the M10 is substantially improved by a four-section construction that allows for specific densities of polymer to be prepared for different zones around the helmet lining. Not only is energy performance improved but also fit and comfort. What's in the bag: Spare Visor, Racing Helmet Bag.